Amazon.com description: Product Description: For a lawman, life in Yuma Prison is a death sentence. Crooked town marshal Jeb Beeson has laid down the lawâhis law. If Longarm isnât on the Monday train out of Yuma, his casket will be. But Deputy U.S. Marshal Custis Long isnât about to be chased off by a bullying badge toterâhe has a job to do. Former lawman Tom Ray has been falsely convicted of murder and left to rot in Yuma Territorial Prison, while the men who set him up steal his gold claim. When Rayâs beautiful daughter Jessica asks Longarm for help, the deputy marshal canât say no. Heâs not about to let a good lawman die in a bad prisonâor let a bunch of dirty dogs get rich on a dead manâs claim. 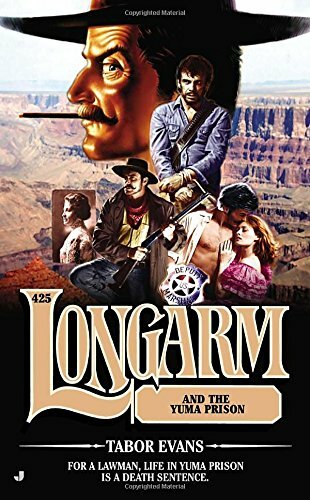 from Jove Pubns (March 25, 2014); titled "Longarm and the Yuma Prison: Longarm and the Yuma Prison"
About: For a lawman, life in Yuma Prison is a death sentence.